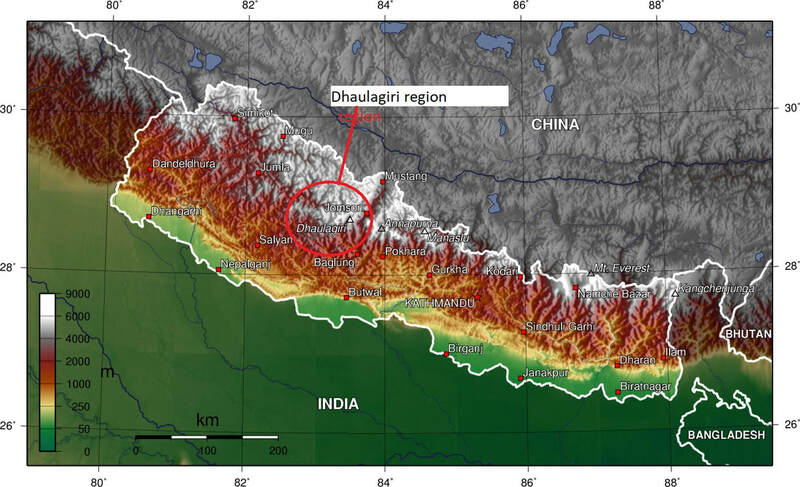 Dhaulagiri range offers visitors all the photographic splendor of the Annapurnas, yet the area is less visited by tourists, and less developed in general. For some, this adds to its appeal. Lying in the western half of Nepal, the range is bordered on the east by the Kali Gandaki, a unique river which pre-dates the Himalayas and carved the deepest gorge in the world during their uplift. North of the range, in their rain-shadow, lies the mystical land of Dolpo. The area is accessed through Pokhara, the main tourist resort. Baglung and Beni are the two district towns, both having a range of shops, a few higher standard hotels, banks and ATMs. There is only one surfaced road which runs from Pokhara to Baglung, with an off-shoot to Beni which continues (unsurfaced) to Jomosom. Regular buses, share-jeeps, and taxis run the route; dirt feeder roads split from this, with occasional buses. There is also a dirt road which runs south from Dhorpatan to Tansen, with a link road to Baglung. There are countless scenic mountain villages in Nepal but few so hidden, isolated, and inaccessible as Gurja Khani. Hidden Village lies 8 hours' walk beyond other villages, nestling on a sun-bathed shelf in a wild valley all its own. To the south, the main walking route has to cross a 3,300 metre pass; to the east, access is blocked by an impenetrable gorge; to the west 4000m passes lead to the high-altitude wilderness of the Dhorpatan Hunting Reserve. Ten kms north of the village lies the ultimate barrier – the majestic south face of Gurja Himal, over 7 kms high. The densely-packed village comprises 230 households of Chantyal and Bishwakarma people, who came to the area for copper mining. The Chantyal were the miners, and the Bishwakarma processed the raw ore into copper. Mining ceased long ago, but hidden tunnels remain. The same alley-ways down which miners used to walk still twist and turn through the labyrinthine village, which opens at intervals into stone-flagged courtyards where grain is spread to dry, children play and women spin and weave wool blankets. Architecture is totally traditional in design and materials, and some of the older homes have carved windows. When the village becomes snow-bound in January and February, the villagers descend to temporary dwellings near the Dhaula river. Lulang is unique in that it is a large village populated entirely by the Dalit caste of metal-workers, called Kami or Bishwakarma – which is shortened to Bika or B.K. Nowadays, very few of them practise their traditional occupation; instead they make a partial living from the land, which they must supplement with wage-labour work. More and more men are going abroad for employment in the Middle East and Malaysia. The village lies on a steeply-rising crescent of terraced fields, with the houses attractively decorated in red ochre, grey, and white mud, painted in stripes and other designs on the outside walls. Lulang is one of the poorest villages in the area. The inhabitants of Chim Khola are Magars, the largest of the Tibeto-Mongolian ethnic groups of Nepal. Magars have a strong sense of community cohesion, and like to live in dense compact villages. In Chim Khola, rows of terraced houses are stacked like staircases on the steep slopes of the Chim Khola valley. Electricity is supplied from a small hydro-power plant by the river. If you stay overnight in this village you are bound to meet some retired soldiers, for Magars have a long tradition of serving in Gurkha battalions of the British and Indian armies, as well as the national army. Gurja Himal:7193m. Best Views: Routes 1,2,3,4, 5, 7, 8, 10, 11 Gurja Himal’s south face is almost as dramatic as Dhaulagiri 1, rising around 4000 metres vertically from its base. Gurja Himal was first climbed in 1969 from the Churen Glacier Sanctuary access.